Between 2006 – 2008 Warwickshire Area put in 109 claims to add paths to the Coventry definitive map. The Council made no progress due to lack of resources. There is a cut-off date for claims based on historic documentary evidence at 1st January 2026. Claims should be dealt with by the Council by then or the paths will be lost. However, it is probable that as long as the claims are logged by the Council by the cut-off date, they will be ‘saved’ and can be dealt with later. Coventry Council has rejected our 109 claims on a technicality. They now require copies of the documents relied on as historic evidence. The research has been done and the documents listed and referenced. We now need volunteers to go to the Record Offices at Coventry and Warwick to photograph the documents. 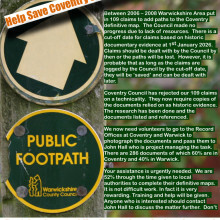 There are 286 documents of which 60% are in Coventry and 40% in Warwick. Your assistance is urgently needed. We are 52% through the time given to local authorities to complete their definitive maps. It is not difficult work. In fact it is very rewarding. Training and help will be given. Anyone who is interested should contact hello@coventryramblers.org.uk to discuss the matter further. Don’t let these public rights of way be lost forever!